Planning a Move? Here are a Few Tips That Can Help! It’s something that nobody particularly looks forward to, but moving is just a part of life. As a matter of fact, did you know that the average person will move almost a dozen times in their life? That’s a lot when you really think about it. Sure, we might look forward to a new living space, but the prospect of packing up all of your things and figuring out how to get them from Point A to Point B can be daunting to say the least. The good news is that Point Pleasant’s junk removal experts at Barten Bros have a few tips for you! As you can probably imagine we’ve been called in to help for a number of moves over the years and that’s why in today’s post we’d like to share a few tips that we’ve picked up over the years that can make your move just a little bit easier. Will it solve every problem? Well, probably not, but we can say that the tips you’ll find below will definitely help. Keep reading to learn more! First and foremost you should focus on getting rid of the stuff that you just don’t need anymore. It happens to pretty much everyone. We all have a way of accumulating things over the years and it starts to pile up. “I might use that at some point, so I should probably keep it.” “I don’t like it, but my aunt gave it to me so I can’t get rid of it.” Whatever the case may be, if you haven’t used it in a year, you probably don’t need it so why not take the opportunity to get rid of it? Fortunately the junk removal pros at Barten Bros would be happy to haul away junk that you don’t need anymore. We focus on donating the things that can be donated and getting rid of the rest so if you’re planning a move and you need someone who can help you to downsize, look no further. We proudly offer waste disposal, trash removal, junk car removal, mattress removal, and more so if you want to get rid of it, we’d love to help! Stay Tuned for Part Two! Now that you’ve gotten rid of the stuff that you won’t be taking with you, what else can you do to make sure that your move is a success? You’ll have to stay tuned for part two of this post to find out. 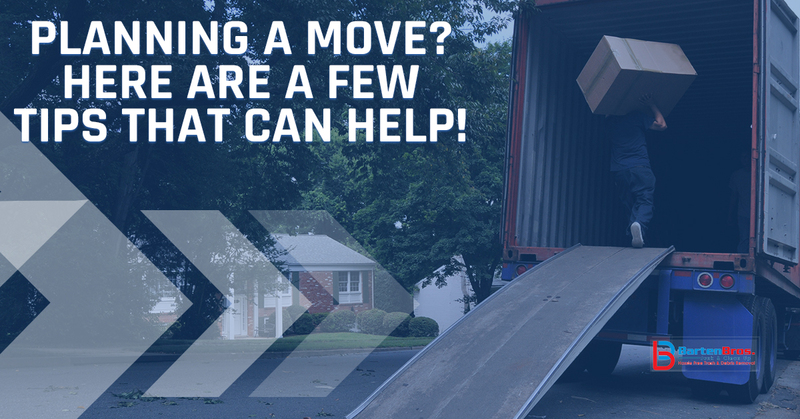 As we mentioned above, we’ve been in this business long enough to have helped a number of people who are planning their moves and we’d be glad to lend a helping hand if you’re moving whether it’s across the city or to a new state. Contact the junk removal experts at Barten Bros today to get the process started. We look forward to hearing from you and helping to make your next move an absolute breeze! ©2018 Barten Bros. Junk & Clean Up - Do not copy. All rights reserved.